What’s The Deal With Mealtime Prayer? If you’ve grown up in a Christian home or observed a Christian you know, chances are that you pray before you eat your meals, or seen someone do it. The term most of us use in praying for our food is “saying grace.” It is so common that we don’t really take the time to think about what it means to say grace, or even why we do it. Sometimes it’s good to step back and think about the traditions we hold, even if some of those things are great and have godly actions. I myself have prayed quickly over my meal when I’m extra hungry or in a rush. It’s very easy to do when it’s something you do constantly, and we can all agree that mealtime prayer is in the top five of all-time prayers! One of the greatest prayers of all time! But when you sit and think about why we pray for our meals, it’s such a beautiful thing. To acknowledge and give God thanks for His continuous provision in your life. To remember His faithfulness in the smallest details. To bless those who made the meal we are eating if we didn’t make it ourselves. The beauty in this is that when you make a conscious effort to thank God for what you have, you recognize how involved God is in your life. God is as involved in the regular consistent patterns of your life as the spectacular moments where He makes a way out of no way for you. If we are honest, living in a country that has so much food, we don’t realize how blessed we truly are sometimes. We take it for granted that we can go out to eat at restaurants all around us, or that we can go to the supermarket and pick up whatever we need to make the food we want. We have it so good that we can choose to eat fully organic, vegan, and without GMO’s. If we make this prayer of saying grace just a “thing we do before eating” and we don’t take the time to pray from the heart, we lose sight of what’s really happening here. This prayer is a prayer of thanksgiving, and God is blessed by it. 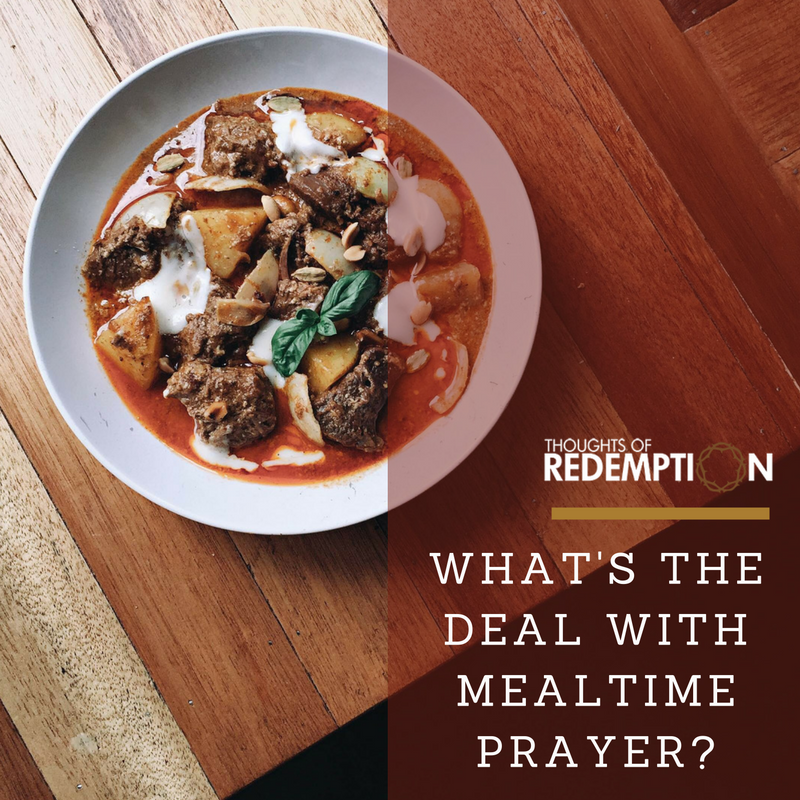 I know that this will seem extra meticulous to some, and I’m not the one for long-winded prayers when I’m ready to chow down, but I encourage you to take your mealtime prayer more seriously. If you have a prayer that you say everytime you’re about to eat, stop and think about what those words mean. If they don’t mean anything to you, switch up what you say, and think about what you really want to say from the heart. You want to pray that God specifically bless the person who cooked for you, ask God to bless them by name. If you want to break free from your mindless prayer in the past, ask God to break the monotony, and make you sensitive to everything that made it possible for you to eat and enjoy your meal. The beauty in eating is that it’s not only functional, but you enjoy it. Say grace, and when you do, think about the grace of God and His goodness towards you! It’s National Poetry Month, Time for a Poetry Challenge!